10 steps to solving any sizing question – How many baseballs fit inside a Boeing 747? Occasionally, I come across useful resources that I feel compelled to share. The McKinsey Blogs Wiki. This is a compilation of blogs by alumni and current firm members. I’ve mentioned Marquis’ blog before as a resource for aspiring consultants, but the others are worth a browse and cover a broad array of topics – from entrepreneurship to healthcare to potpourri. This post continues my Core Articles series. You can read my previous post on Case Studies 101. What follows are the top 10 steps you must take to master those pesky sizing questions and impress any interviewer. 1) Ask for 30 seconds to 1 minute upfront to gather your thoughts. Take this time to sketch out an early course of action and generate interviewer questions to clarify what’s being asked. 2) Round your answers at each step. If a calculation results in 101 golf balls, use 100 golf balls for the next step. If your answer is $8200, use $8000. This will minimize future mistakes and communicate to the interviewer that you know what you’re doing. As long as rounding doesn’t change the answer by more than 10%, proceed. 3) When you need to make numerical assumptions, pick friendly numbers (eg, 5, 10, 25, 50, 100, etc.). For instance, if you need to estimate the percentage of people in the U.S. that play basketball, it’s better to assume 5% than 7%. 4) Clearly label units when taking notes. Don’t get units confused – it’s one of the most common mistakes in sizing questions. Don’t end up with an answer for the average calls/hour/user when the interviewer is actually asking for the average minutes/user/month. Yikes. 5) Avoid numerical ranges. If the question is “How many baseballs would fit into a Boeing 747?”, don’t start your thinking process by saying “First, I’d estimate the volume of a 747 to be between 10,000 and 20,000 cubic feet.” Stick with one number. Ranges provide unnecessary complication and will double the number of calculations. 6) Use a “sniff test” for each calculation. If the answer doesn’t feel right, communicate that doubt with the interviewer (e.g., “The answer seems high to me”). Double-check assumptions and steps taken. If it still doesn’t feel right, it’s OK to move on, but make a note of this potential problem area. You can insert any question in lieu of “too aggressive an assumption.” The key is that you’re not just asking what you’re doing wrong, you’re hypothesizing on the source of the error. 8) Read interviewer body language. As you’re communicating the steps taken, it can be easy to focus solely on your notepad and calculations. Periodically look-up to see how the interviewer is responding. If they have a quizzical look, it’s ok to continue, but again, make a note that this may be a problem area. If they’re nodding consistently, you’re in good shape. 9) Communicate each step clearly and concisely. Case studies and sizing questions are as much about communication skills as they are about problem-solving skills. What value is a great solution if you can’t persuade the client to implement your recommendations? If the question is, “How many bottles of wine are consumed annually in the U.S.?” – separating wine consumers into an active consumers group (drink a glass everyday) vs a casual consumers group (drink a glass every week) is correct and makes a qualitative difference. Further segmenting into male vs female active consumers and male vs female casual consumers is an example of over-complication. Check out The Consulting Bible for more expert advice on mastering your consulting interview. 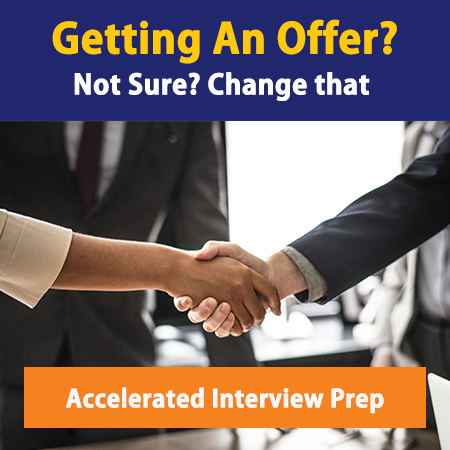 It’s the top global resource on fit/experiential interview questions, sizing questions, and case studies – it’s like a 10-hour phone call where we tell you every secret we know about getting jobs at the world’s best consulting firms.